A notice promoting the Harmony Square vigil on 21 March. A second vigil is set to be staged in Dandenong in response to the recent horrific events at the Al Noor and Linwood Mosques in Christchurch. 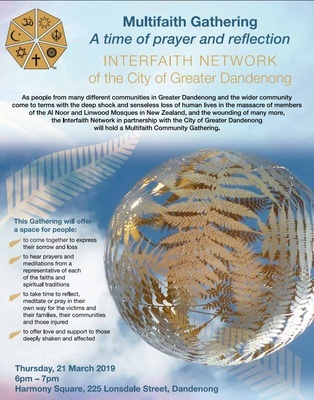 Greater Dandenong Interfaith Network has organised a one-hour ceremony at Harmony Square on 21 March. It will include a series of prayers and meditations delivered by faith leaders, a minute’s silence and the assembly of flowers as a tribute. Members of the public are welcome to bring and place flowers during the event. “We don’t need to always agree,” IFN development officer Helen Heath said. The New Zealand tragedy had given people “pause for thought”, Ms Heath said. “It’s so close to home – not just because it’s in New Zealand but because it’s an Australian who is involved. The interfaith network staged similar vigils in the wake of the 2004 Boxing Day tsunami and the 2009 Black Saturday bushfire disasters. The vigil is at Harmony Square, corner Walker and Thomas streets, Dandenong on Thursday 21 March 6pm-7pm.